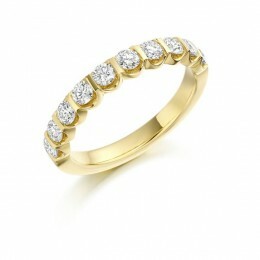 “Blossom” is a beautiful eternity ring made of beautiful round brilliant cut diamonds stunningly scallop set in yellow gold. This ring is available in quarter eternity (diamond on quarter), half eternity, three quarters eternity or full eternity (diamond all the way around). 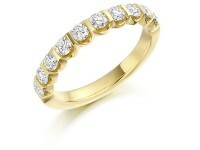 You may also choose between white gold and platinum and yellow gold or rose gold.